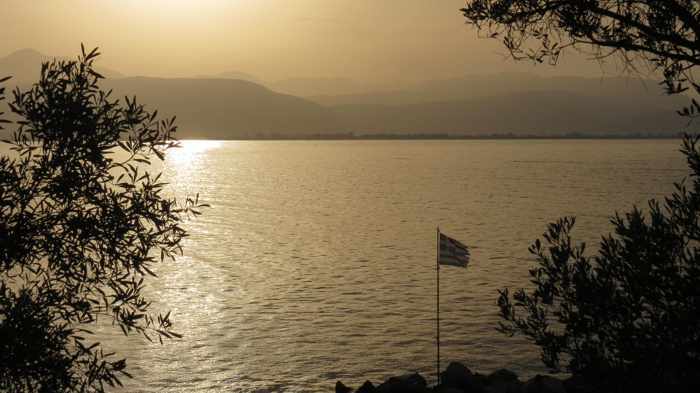 ♦ Restroom/toilet facilities, and places to buy food and beverages, are available only at Arvanitia and Karathona beaches. At Arvanitia, the Blublanc Beach Club has a restaurant serving Greek & Mediterranean cuisine, a bar, change rooms, showers, WCs, and lounge chairs with umbrellas. The facility is open from the beginning of May until the end of September, and during peak season hosts occasional parties and special music events. There are several organized areas where you’ll find beach bars & cafes, including Outopia, Big Fish and Small Fish, that provide music, lounge chairs & umbrellas, and drink & snack service right on the beach. If you can’t find a vacant chair and umbrella, or didn’t bring your own gear, hundreds of trees along the beach provide shade if you need to escape the hot sun for awhile. 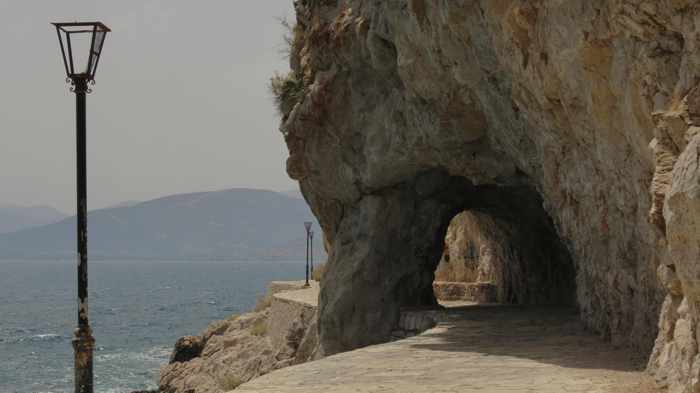 There are at least two traditional Greek tavernas at Karathona as well, and they’re located close to the south end of the beach. 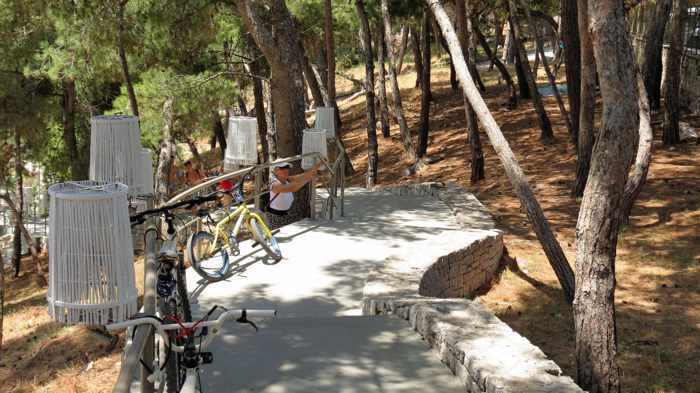 ♦ Though parts of the Arvantia promenade and the Karathona beach trail are shaded by trees, most of the walk is exposed to the blazing sunshine. 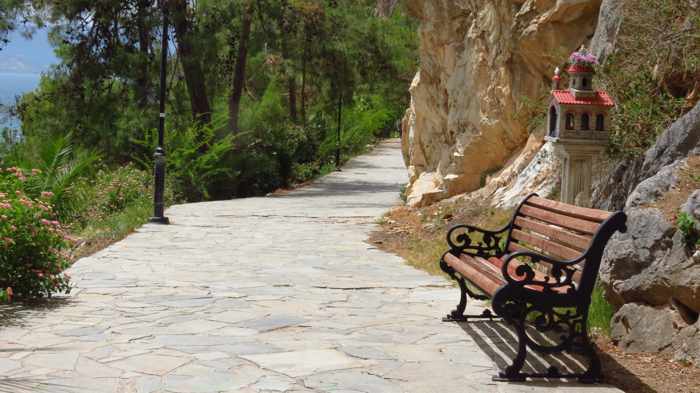 There is no shade whatsoever along the trail to Agios Nikolaos Church. Even in late May and early June, which is when we have walked the trails many times, the sun has been blistering hot, so be sure to wear sunscreen and take along a hat and something to cover your shoulders and arms if you tend to burn in those places. 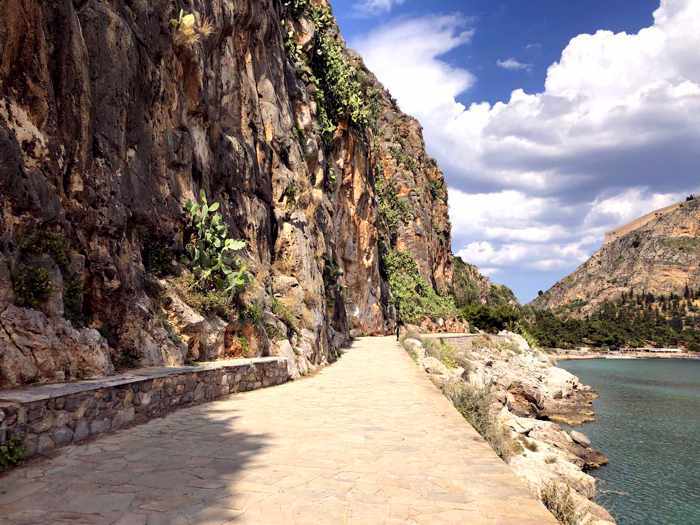 ♦ Arvanitia promenade is mainly flat with some gentle inclines, so it’s quite accessible to visitors with mobility issues. We have seen people using walkers, canes, crutches and wheelchairs enjoying a stroll, even if they ventured only part way. 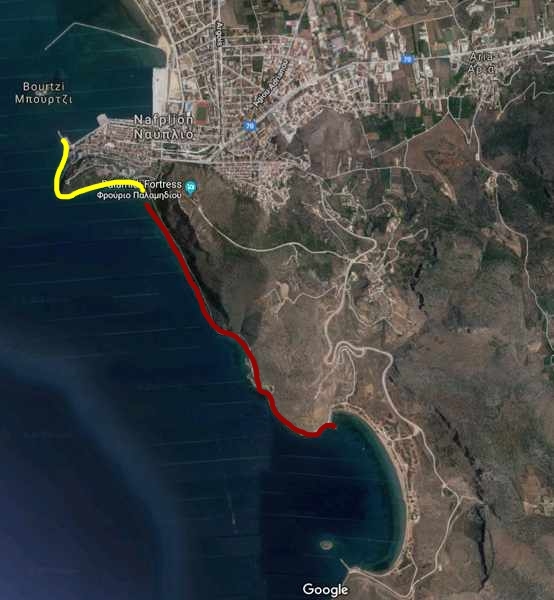 The Karathona walking route, on the other hand, is a wide dirt trail that we wouldn’t recommend for people with mobility challenges, since it has some sloped segments as well as many spots where the sand and gravel can be loose and slippery under foot. 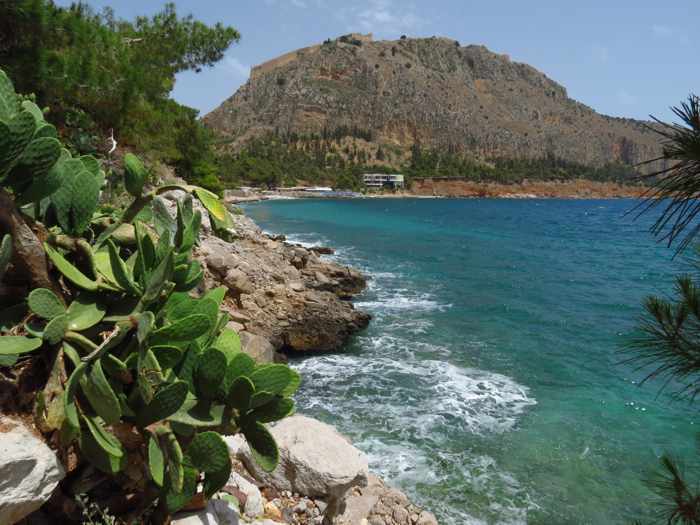 Wear sturdy shoes, rather than flip-flops, if you plan to walk all the way to Karathona beach. 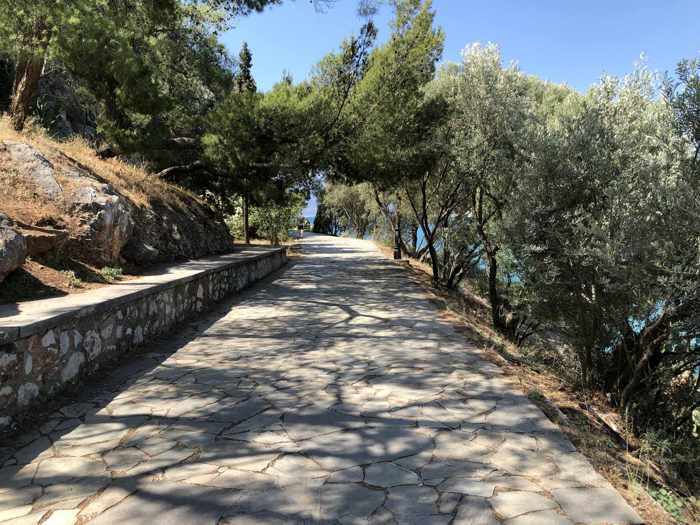 The trail to Agios Nikolaos Church is not suitable for people with walking difficulties since it’s narrow and winds across uneven hillside terrain. The trail surface varies from hard-packed dirt to loose stones and rocks, so tread carefully — it’s easy to slip and skid on the stones. 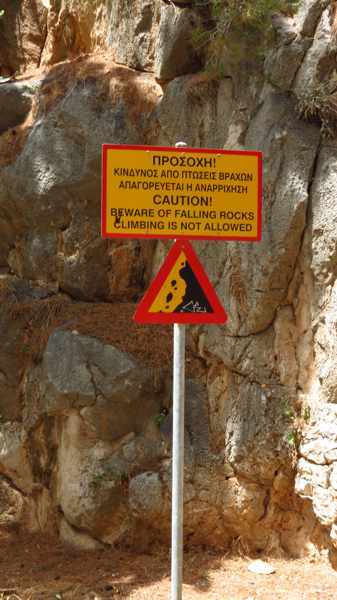 ♦ Bear in mind that since the Arvanitia path is built along the base of sheer cliffs, there is an ever-present rockfall risk to walkers, and signs warn pedestrians of this potential danger. Soil and stones occasionally come loose from the cliff face and tumble to the ground, but rockfalls are fairly rare. Nevertheless, they can and do happen; in fact, a serious landslide of boulders and earth occurred less than three weeks after our last visit in June 2018, blocking the path for several days until much of the debris could be removed. (As of last September, a huge refrigerator-sized rock was still sitting where it had fallen on the on the path during the spring landslide). Luckily no-one was injured when the boulders plunged onto the promenade. Below are photos showing some of the sights and scenery that walkers will encounter along each of the walking routes. 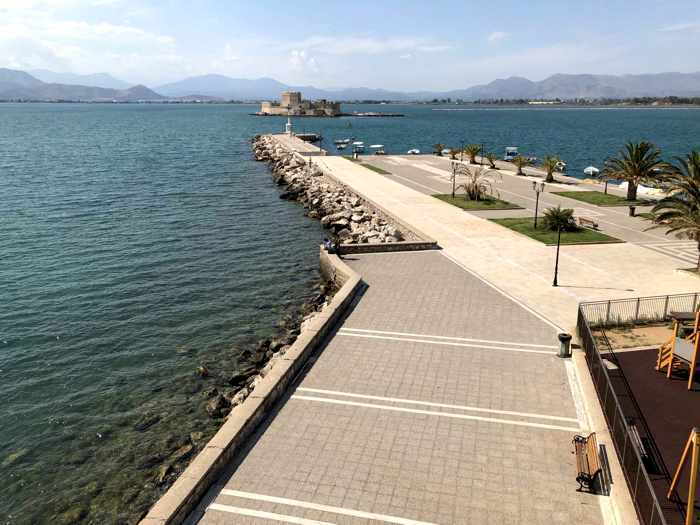 A view of the Bourtzi sea castle and the Nafplio waterfront square that locals call The Shore. 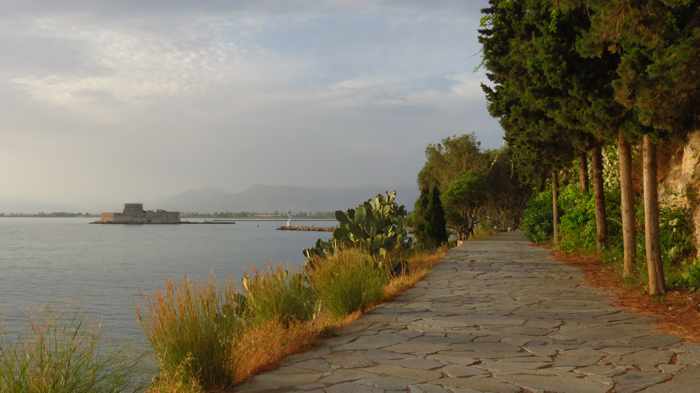 The wide, stone-paved path in the bottom half of the photo is the starting point of the Arvanitia promenade. A view of Acronauplia peninsula from the west edge of The Shore. 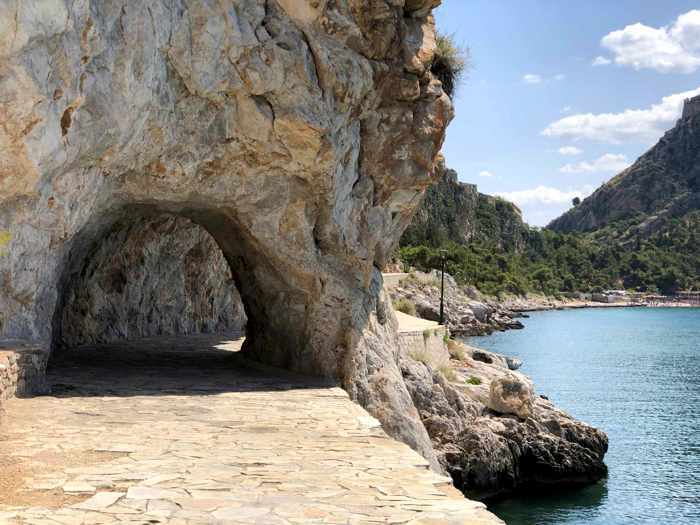 Roughly one-third of the Arvanitia promenade follows the coast shown above, while the rest of the walkway crosses the far side of the peninsula. 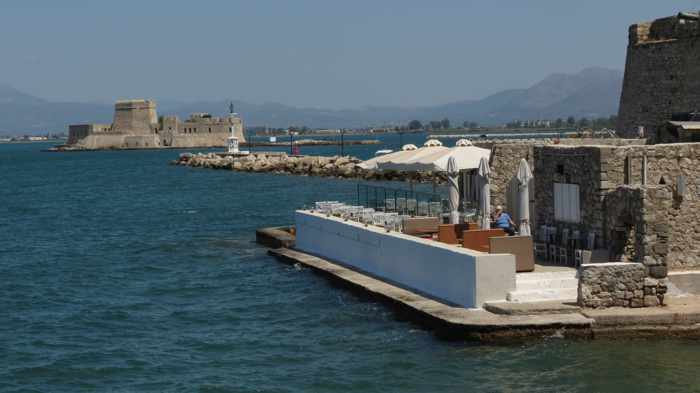 (The large building atop Acronauplia is the Nafplia Palace Hotel & Villas). The promenade passes Agnanti restaurant, which has an open-air patio right beside the water. 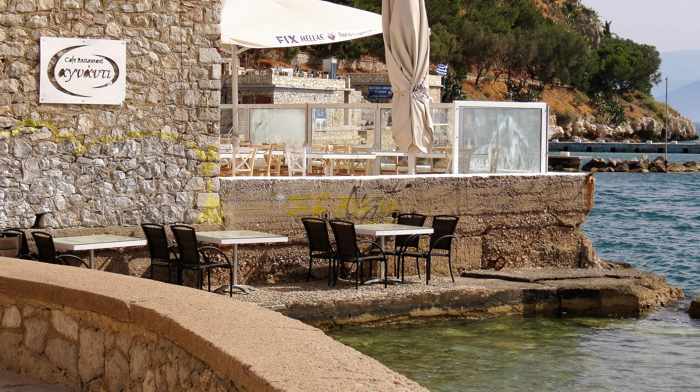 It is the last place you can grab a bite to eat until you reach the Blublanc club at Arvanitia beach, 1 kilometer away. Another view of Agnanti. 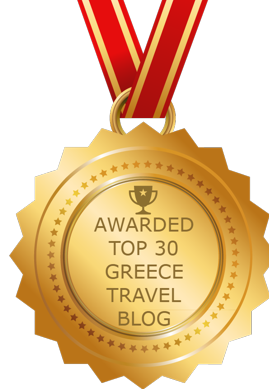 We haven’t dined here yet, but the Visit Nafplio website calls it “a pearl” and highly recommends a visit. Agnanti would be ideal for a romantic sunset dinner. 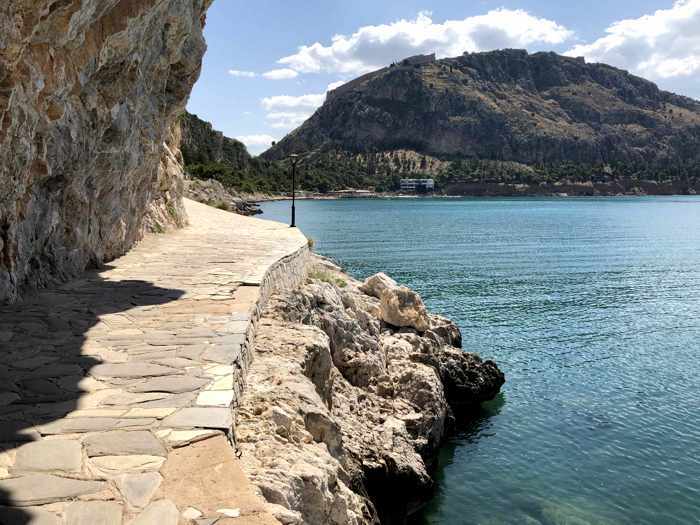 Despite its exceptionally long waterfront, Nafplio has surprisingly few restaurants close to the sea, and none as near to the water’s edge as Agnanti. A graffiti-bedecked passageway opposite the entrance to Agnanti restaurant. 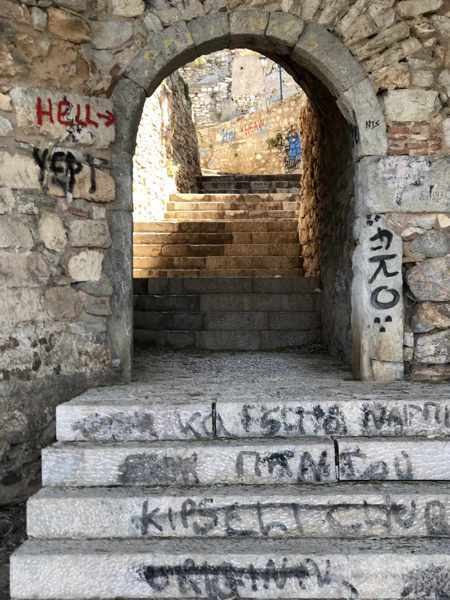 The steps lead to the Bastion of Pende Adelphia (Five Brothers), which historians believe was built by the Venetians in the 15th Century. 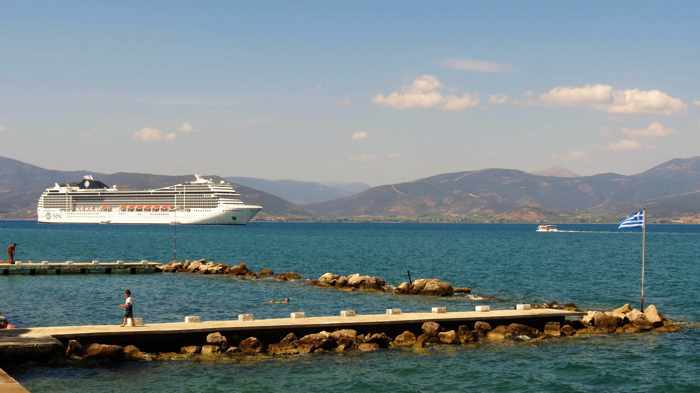 A cruise ship at anchor in the Argolic Gulf near the Banieres swimming area. 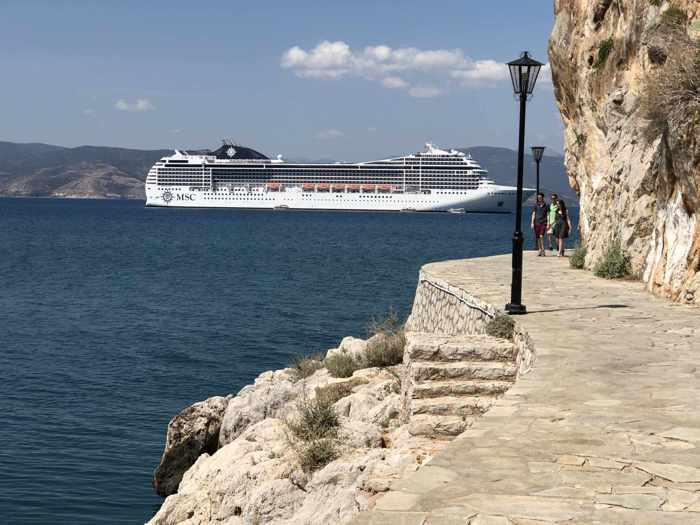 The Arvanitia promenade is a popular attraction for daytrip visitors to Nafplio — we passed several families and small groups of passengers from the ship as they strolled the path during their port day in Nafplio. 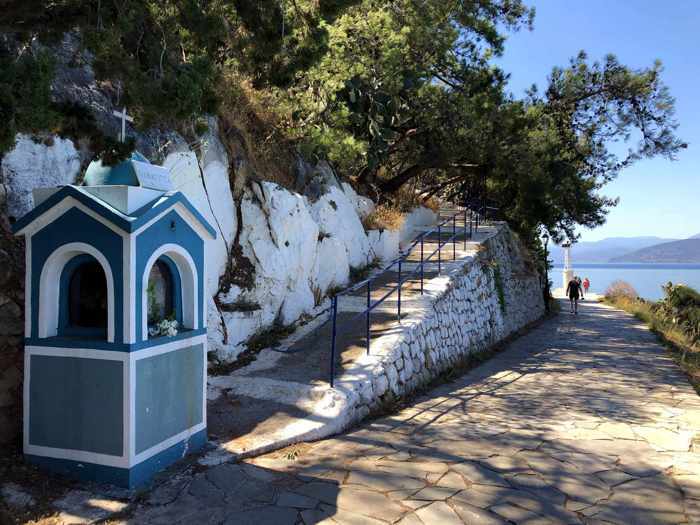 A memorial shrine stands at the bottom of steps leading to Panagitsa Church, which is tucked against the cliff above the Arvanitia promenade. It’s an interesting church to visit and the views from its location are excellent, so it’s worth a quick detour if you don’t mind an uphill climb. 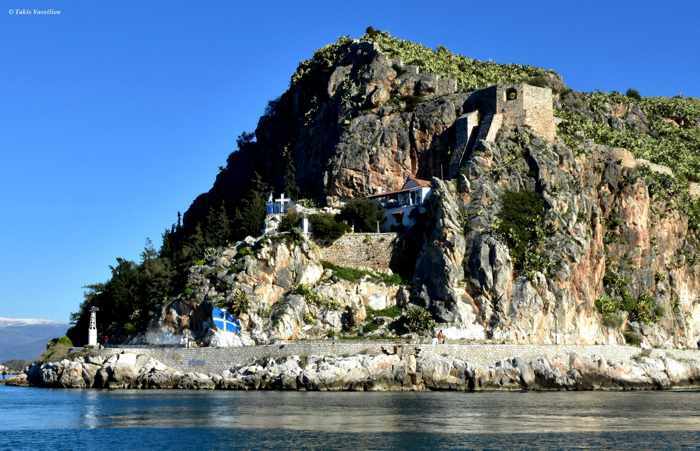 Here’s how Panagitsa Church and the Arvanitia promenade look when viewed from a passing boat. 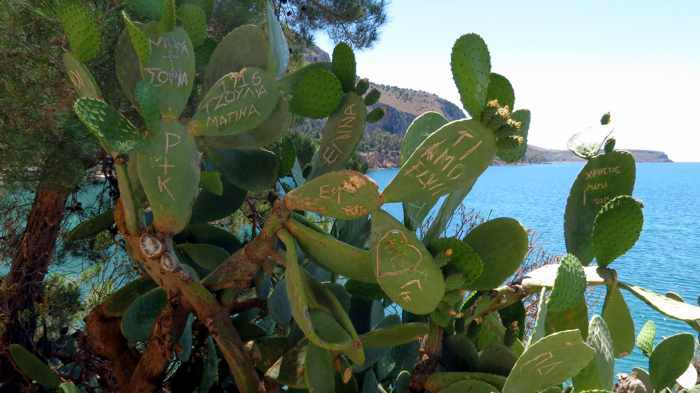 The photo was shot by Takis Vassiliou, who owns Takis Souvenir Shop on Amalias Avenue, and was shared on his Nafplio Kalimera page on Facebook. 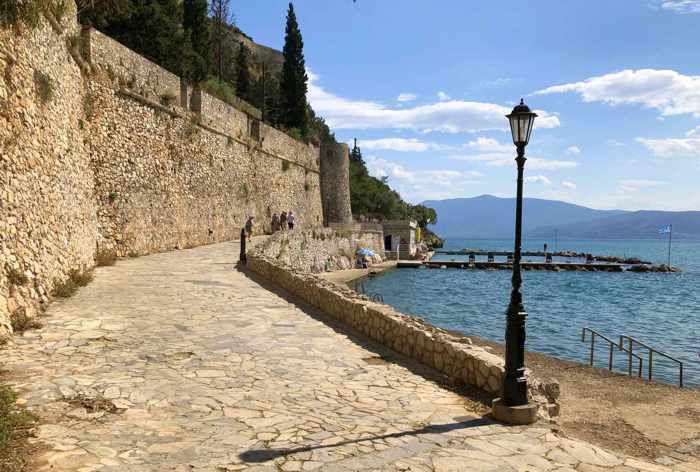 Takis regularly posts beautiful photos of Nafplio on Facebook, and his timeline photo album now features more than 1,680 images, including over 900 contributed by Nafplio fans who follow his page. 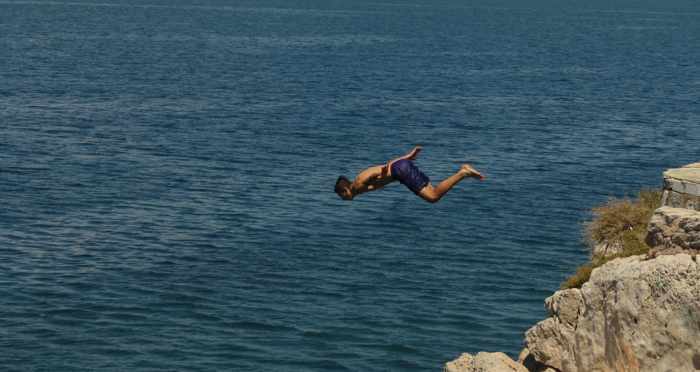 A young man dives into the sea from rocks at the edge of the promenade near the spot shown in the photo above this one. 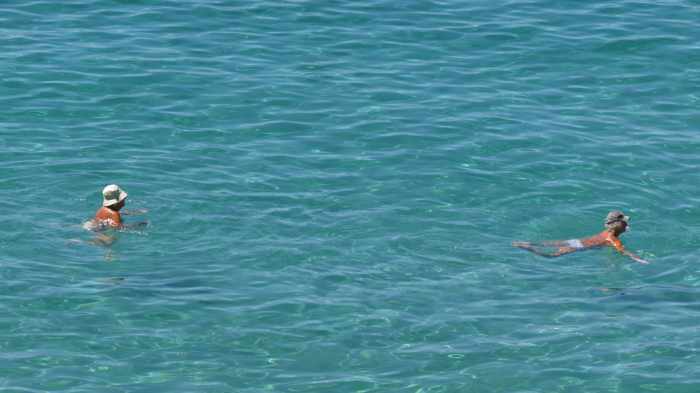 We have seen groups of local lads diving here during several of our walks along the promenade. 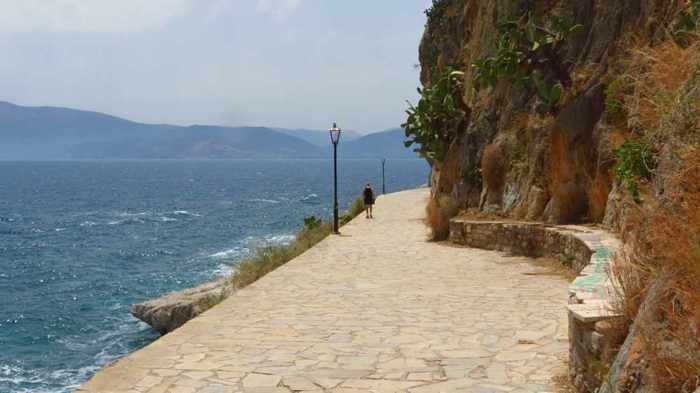 Steps lead onto the rocky shoreline at various points along the promenade, on the stretch that faces Arvanitia beach. 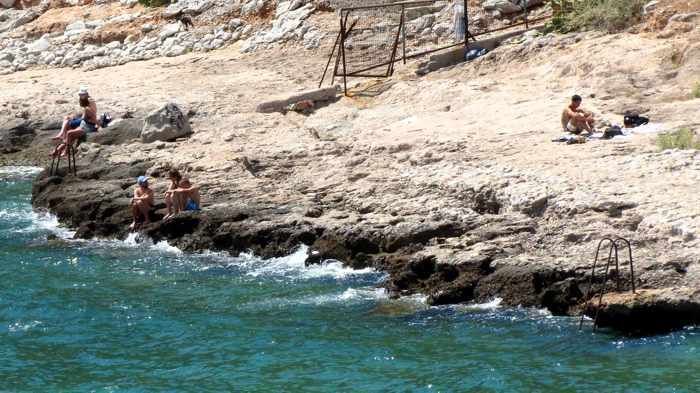 We’ve seen people clamber down to sit or sunbathe on the rocks, or to jump into the sea for a swim. Another view of the passageway. Boulders and debris from the June 2018 rockfall landed on the pavement at this spot. 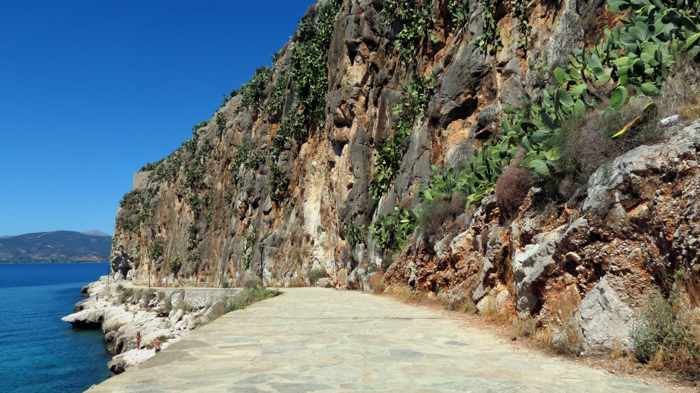 Rock climbing is forbidden on the Acronauplia cliffs, according to signs posted along the promenade. But we have seen climbers testing their skills on these slopes several times. 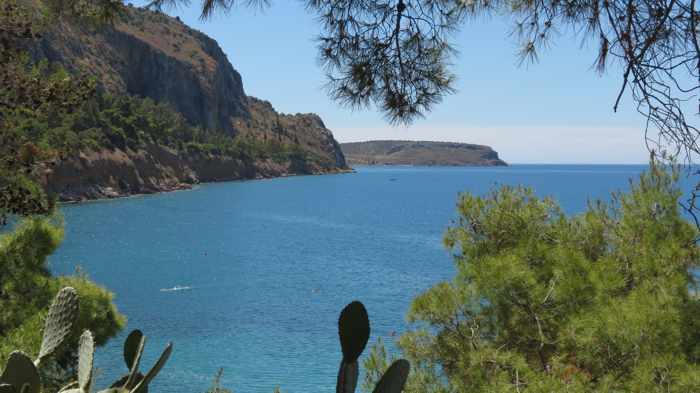 A view of the coast between Arvanitia beach and Karathona. 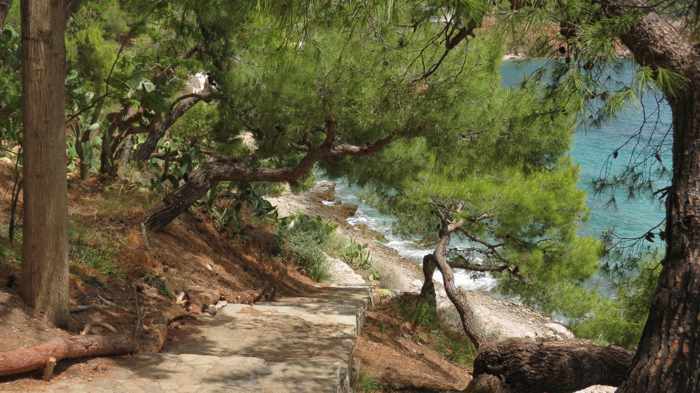 The footpath to Karathona is hidden behind the long rows of trees above the seaside. 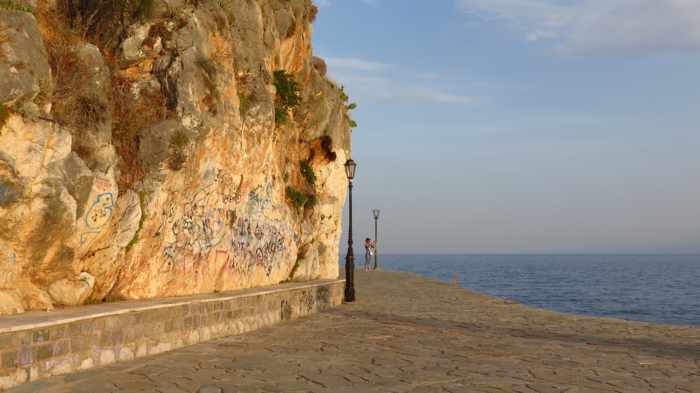 The promenade ends at Arvanitia Square, which serves as a parking area for people who arrive by car to visit Arvanitia beach or walk the coastal paths. 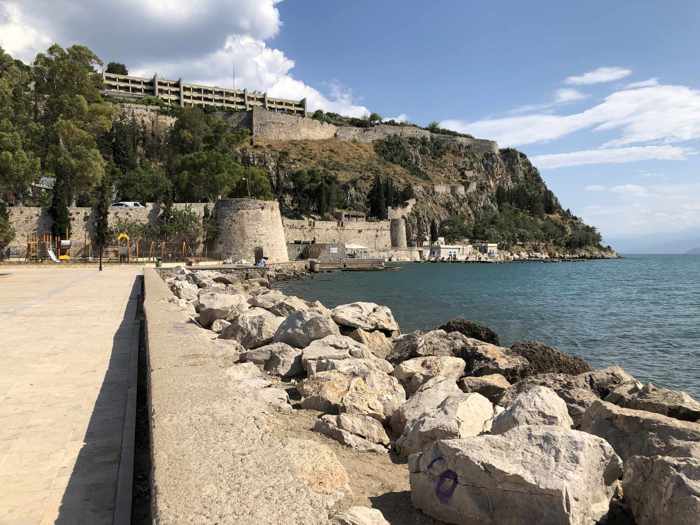 To reach the beach and Blublanc club, follow these steps down the hill. 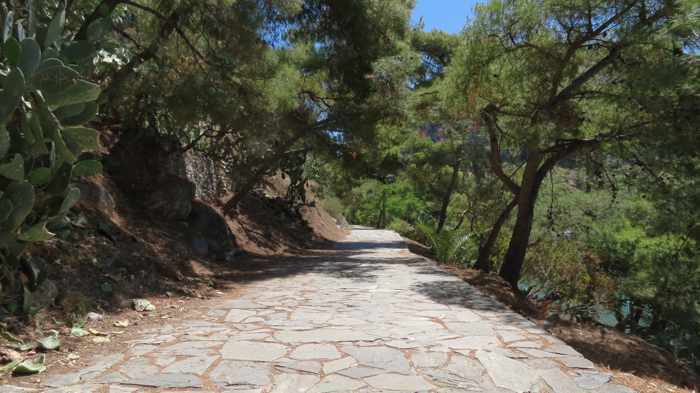 Please click on the link below to view photos of the Karathona path on page 3.